Patriotic Pals: Tales of Civil War Dogs by Chris Stuckenschneider. Review: Boom! There goes the bullet along with Brutus. Although it is dangerous, to Brutus it is like a game (luckily he never caught any bullets). The book Patriotic Pals: Tales of Civil War Dogs by Chris Stuckenshneider, is about dogs that helped in the Civil War. 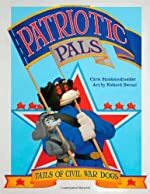 In Patriotic Pals, Chuck and his poodle friend (Chuck is also a dog) go on a road trip to many historical museums and military parks. There they find many different dogs that have helped in the war. For example, one dog Brutus collected bullets, and he alarmed the regiment when enemies were nearby. In Patriotic Pals you will find interesting facts about different dogs that helped and served in the Civil war. Patriotic Pals is intended for ages 8-10 because it contains some words that may be difficult for younger children. The author also makes the setting very clear. For example, on page one the book states the dogs are at the Missouri History museum in St. Louis. Patriotic Pals provides many descriptive words that help readers understand the book even more. I love how the author wrote the story in first person, which makes it far more interesting than it would have been in 3rd person. Learning about the role of dogs in the Civil War makes for a unique story. Readers can learn how helpful everyone, including dogs, was in the Civil War. I recommend this book to anyone who wants to learn facts about the different roles of dogs in history. We would like to thank Reedy Press for providing a copy of Patriotic Pals: Tales of Civil War Dogs for this review. Have you read Patriotic Pals: Tales of Civil War Dogs? How would you rate it?